16 pp. Roman, 659 pp. - Grammaticalization and comparative Berber morphosyntax. 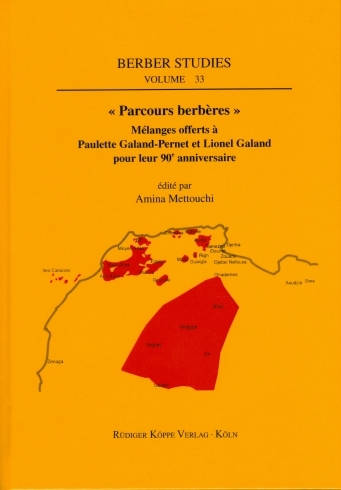 Her comparative work within Berber involves mainly Siwi, Ghadamsi, Kabyle, Tumzabt, Taggargrent, Tashelhiyt (Shilha), Tamazight (Middle Atlas Berber), Tahaggart and Tamashek. She works on spontaneous spoken data, and she is interested in all linguistic aspects of oral production. Recently she initiated a corpus project for Berber languages, furthermore she es the Principal Investigator of a corpus project on spoken Afroasiatic languages (CorpAfroAs), funded by the Agence Nationale de la Recherche (2007–2012). She has just been granted another ANR corpus project on Spoken Corpora and Cross-linguistic Comparability (CorTypo), 2013–2016.